Ten workers were killed while doing maintenance work on underground pipelines in a Qilu Tianhe Huishi Pharmaceutical Co. plant in eastern Shandong province. It was China’s second fatal industrial accident in less than a month. Eight people were suffocated to death on the spot by heavy smoke after welding sparks set off a fire, according to the government-backed newspaper People’s Daily. Two other people died later in a hospital, and 12 rescue workers were injured. An investigation has been launched. An environment inspector said the accident didn’t cause severe impacts on the surrounding environment. 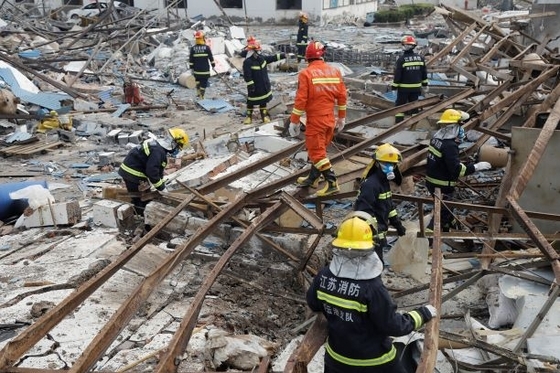 Last month, a blast in a chemical factory in Xiangshui County, Jiangsu province, killed 78 people in one of China’s worst industrial accidents in recent years. A total of 26 people have been detained by authorities over the accident.